Whether you're new to knitting, crochet, and other fiber arts or are a long-time, dedicated fiber fanatic, you're going to want to get to know Ravelry. If you've been in the knitting community online for much time at all, you probably already know about this sort of social network for knitters, crocheters, and other fiber fans, but if you're new knitting, allow us to introduce you. Ravelry is an online community for knitters, crocheters, and others who work with fiber. It was launched in beta in 2007, and it's fair to say it took the knitting world by storm. A combination of a social networking site, a place to share information about patterns and yarn, a forum, and a place to keep records about your stash, your needle collection, your current projects, and more, it has quickly become the must-join site and every knitter's favorite time black hole. As of this writing, the site has over 7 million registered users. You can usually find around 5,000 Ravelers online at any given time from around the world. You can see what projects other people are making (with links to patterns that are free), what kinds of yarns are most popular (on needles or in stashes), and people's favorite patterns and finished objects. A friending system allows you to keep track of what people you know are working on, and patterns are ranked by hearts and ughs so you can see which patterns are crowd favorites and others that didn't turn out so well. You can browse patterns for various knitting and crochet projects, find free patterns, or find patterns those that call for a particular kind of yarn. 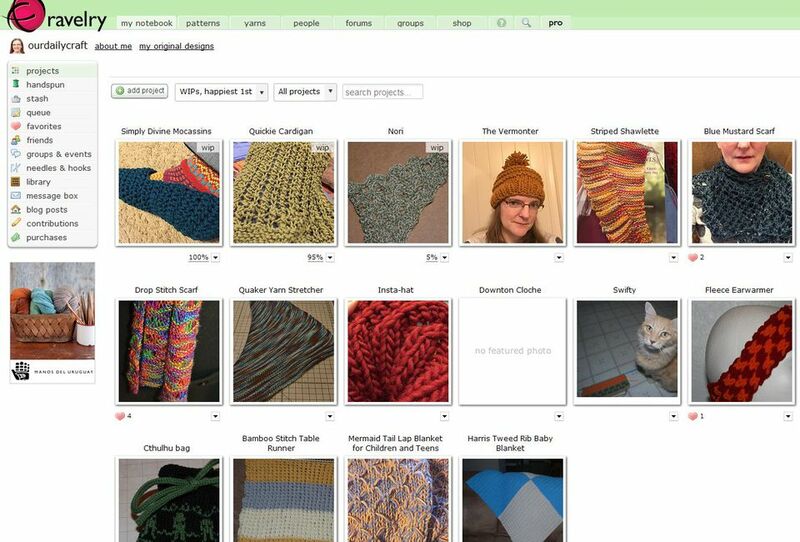 It's the perfect place to go looking for your next project (or several), keeping track of them in your queue, sharing in-progress photos, keeping project notes and noting who you gave a finished object. Even if you don't get into all the forums and groups and knit-alongs that Ravelry has to offer, it's still a great place to organize your knitting life. As mentioned, you can use it to keep track of things you want to knit and what you are currently working on. But you can also use it to log your yarn stash: upload pictures and include notes on what colorway you have in what quantity, even where it's located in your house so you can find it when you need it; inventory your knitting needles and input which knitting books you own, so when you search for patterns you can see results from the books you already have. You can also buy patterns, or download free patterns, directly from Ravelry and store them in your library, which makes it easy to find them later to knit again or when you've forgotten you bought something and now want to knit it. Ravelry is free and open to people around the world. To join, you just have to come up with a unique username and password.